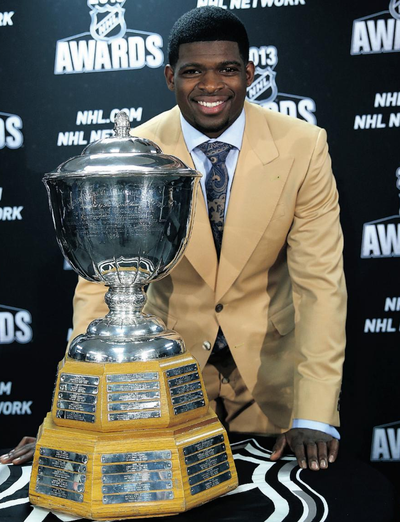 Congratulations to P.K. Subban on winning his 1st James Norris Memorial Trophy and for being the 1st Montreal Canadiens defenseman to win the award in 24 years. When I tweeted 2.5 years ago that Pernell Karl Subban was the best home-grown Canadiens defenseman I’d seen since Chris Chelios, much to the dismay and criticism of his staunch critics, the Norris win was made all the sweeter knowing Chelly was the last Habs player to win it back in 1988-89. It's all the more impressive when you consider Chelios was 27 and in his 5th full season in Montreal when he won the Norris while Subban was 23 and just finished his 3rd. Two big personalities with the talent to back it up; something Montreal has been missing for so long that many Habs fans have forgotten what it’s like to have them around or worse yet, weren’t even born. The fact that Subban won the Norris with the ice time he was given speaks volumes about how effective he was when given the opportunity. Michel Therrien and J. J. Daigneault created roles for their defensemen and managed their minutes well in a compressed, shortened season. Good for keeping fresh and hard to argue against, given the drastic improvement in the Habs even strength scoring differential to a level not seen in more than 15 years. FYI, anyone looking to understand how the Habs went from 15th to 2nd in the East in one season can start right there. So, just well-managed was the time? You’d have to scroll down the NHL’s ES TOI/G rankings, all the way to 75 to find Josh Gorges at 17:43, the top Canadiens defenseman in average even strength ice time while Subban was ranked 102nd in the NHL, 4th among Habs D, averaging just 17:05. Last year, Gorges and Subban were ranked 46th and 48th so it’s not like they couldn’t play big minutes as much as the coaching staff decided they wouldn’t. Considering 1st pairing defensemen typically log 18+ minutes a night and number 1 D north of 19, it’s fair to argue the Habs managed the ES TOI of their defensemen much too evenly, given the disparity in talent among the group and much too conservatively in what was a reprogramming year for Subban to help settle him down. For example; other than Montreal, only Colorado and Edmonton failed to have any defensemen average at least 18 ES minutes a night so yes, Therrien and his coaching staff were much too conservative but given the short schedule, a strategic argument could be made as Subban did lead the Habs in average ES TOI/G during their all-too-brief appearance in the playoffs. Hopefully, it’s a sign of what’s to come in future years. Even though P.K. Subban was 4th on the Habs in total ES minutes, he was by far their most effective even strength defenseman, leading all regular Habs D in 5v5 On-Ice Plus-Minus per 60 Minutes at +1.49, tying Emelin for the team lead in ES points among defensemen, all the while being forced a diet of restricted minutes. To fully understand Subban’s contribution, it helps to know that he was on the ice for 37% of the Canadiens even strength goals scored, excluding empty net goals. That was the highest percentage among the Habs D with only the 4th highest ES minutes. On defense, Subban was on for just 26% of even strength goals against. When you can generate that much net offense with minimal minutes while being defensively responsible, taking the occasional risk is not something the Habs want to completely drum out of Subban’s game. Not when he’s the only defenseman on the roster with the talent to recover from mistakes far more often than not. After Subban signed his bridge contract and returned to the Canadiens, the Habs went on to score another 33 power play goals… and he was on the ice for 88% of them, leading the Habs D in both on-ice % and points with 26. A more compact point shot and receiving fewer passes behind or in his feet certainly helped, thanks in large part to Andrei Markov feeding him the puck on the PP. At this point, there’s no justifiable reason for Michel Therrien to give Subban less than 19 ES minutes a night because from here on out, he’s the best defenseman on the Montreal Canadiens and will be one of the best in the NHL for years to come. The only question is whether Therrien will finally unleash his best horse to carry the load he’s proven capable of in the past. Markov is now entering the last year of his $5.75 million contract and will turn 35 in December. The fact that he played a total of 74 NHL/KHL games this season, the most since 2008-09 is reason enough to be happy and that’s why he got a B rating. That said, there are legitimate concerns that can’t be ignored. As the season wore on, Markov began to struggle, and it actually started long before Emelin wrecked his knee against Boston. Yes, he played 48 NHL games in a compressed schedule but his minutes were, as we’ve seen, well-managed. Markov was 100th in the NHL with an average of 17:07 ES minutes per game and 56th in total ES minutes played at 821:53. His knees also got a full month of rest when he broke his ribs in the KHL during the lockout but his -0.46 5v5 On-Ice Plus-Minus per 60 Minutes was the worst (min 30 GP) of all the Habs regular defensemen, ranking him 130th in the NHL. Markov logged the 2nd most ES minutes on the Habs but was on the ice for just 30% of the Habs even strength goals, producing just 7 points. Given the ice time, the percentage is far too low, as is the production but the real concern is that Markov was on the ice for an alarming 42% of the even strength goals against. Again, worst among all the Habs regular D.
It’s hard to justify giving Markov such a large piece of the ES TOI pie when offensively; he was a significant net loss when he was on the ice. 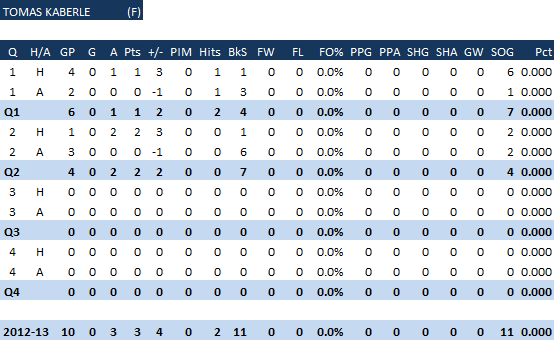 Why then did Therrien and Daigneault give Markov the 2nd most shorthanded minutes when his ES play was clearly suspect? Carey Price may have had the NHL’s worst PK SA% among regular starting goaltenders this season but with Markov not playing well at even strength; he certainly didn’t do the PK any favours, being on the ice for 43% of the power play goals against. What we don’t know is whether Markov’s ES defensive struggles can be attributed to the full year it usually takes to recover after major knee surgery(s). What percentage of his mobility and acceleration are permanently lost? Andrei Markov is a smart hockey player and tried to adjust by cheating towards the boards but often got caught through the middle if Emelin wasn't there to cover for him. Going forward, there are strong signs Markov’s days as “The General” on defense are fast coming to an end. It’s time to seriously consider limiting his ES minutes and taking him off the PK altogether. The offensive skillset and vision are still there to morph into a power play specialist but with Emelin out until December, the Habs are already down a top 4 ES defenseman to cut Markov’s ES minutes down to the 15+/- minutes he should be getting. As for re-signing Markov to a long-term, 35+ contract as a power play specialist, the Habs might want to follow Carolina’s lead and find a taker while the value is still relatively high. Trouble is, the timing is bad with no in-house replacement for Markov anywhere near ready to support Subban as an offensive 2D that can handle the minutes. Gorges was the Habs leader in total and average ES/TOI and finished the year 2nd to Subban at +0.52 5v5 On-Ice Plus-Minus per 60 Minutes. Excluding empty net goals, Gorges was on the ice for 34% of the Habs even strength goals scored and 36% of the goals against. So, given the even strength workload and revolving door of partners, Gorges actually did a lot better than most people credit him for. Unfortunately, Gorges struggled badly on the PK, partially thanks to being partnered with a string of defensemen (Bouillon, Diaz, Markov, etc.) who really shouldn't be spending much, if any time, killing penalties. As a result, Gorges was on the ice for 57% of the Habs power play goals against. Considering Gorges had respectable ES numbers, there’s no great cause for alarm, yet. What Gorges needs most is a steady, reliable PK partner. Barring any significant off-season changes, that should be Subban, as it often was the year before and how the season ended because honestly, the alternatives aren’t very appealing. It’s a shame the Habs lost Emelin for the last 10 games of the regular season, the playoffs and what appears to be the first 2 months of next season. Last year was an adjustment year for Emelin, after 6 full seasons in Russia but this year, Emelin was rounding into form nicely, minus a sudden, ill-advised willingness to start fighting again… with a titanium face. Emelin finished 5th in total ES minutes and was on the ice for 28% of goals for and 29% of ES goals against. More importantly, Emelin was 3rd in total shorthanded minutes among Habs D but was on the ice for just 23% of the power play goals against. On percentages alone, Emelin was better off killing penalties than being paired with Andrei Markov at even strength. With a 4th ranked +0.19 5v5 On-Ice Plus-Minus per 60 Minutes among Habs regulars, Emelin has the tools to be one their best defensive defensemen who, like Gorges, is also capable of 15-20 points. Hopefully, there won’t be any setbacks in his recovery from knee surgery as he’ll be UFA after the coming season so look for the Habs to try and extend one of the only heavy hitters on the roster sooner, rather than later. The jury is still out on Diaz, thanks to the concussion that wiped out half his season and limited him to just 23 games. Still, there are signs he was being asked to play a role that doesn’t suit him particularly well. Ideally, Diaz is a power play specialist and certainly an upgrade over soon to be departed Yannick Weber. His even strength game isn’t nearly as strong as Therrien wishes it were and on top it, being asked to average 2+ minutes a night killing penalties just seems… ill-advised. Diaz should really be a bottom pairing D, limited to 15 ES minutes a night who, in a pinch, can play up the pairings to cover for short-term injuries and contribute on the 2nd power play unit. His defensive game just isn’t strong enough to log top 4 minutes over 82 games. Unfortunately, unless Marc Bergevin goes out and trades/signs a solid number 4 D to cover for Emelin’s 2 month absence, Diaz and Bouillon will once again be asked to do more than they’re capable of and it won’t be pretty. I wouldn’t be overly concerned that Bouillon signed a 1 year extension, and I wasn’t at the time, if the plan was that he wouldn’t dress for about 30 games next season. Problem is, Marc Bergevin just gave Drew Drewiske a 2 year contract to do just that. Defensively, Bouillon is okay at even strength when he’s hidden by line-matching at home, where he was on the ice for 11 ES goals against which was in-line with his minutes and role, but on the road? Yeah, about that. Nobody on the Habs roster was on the ice for more even strength goals against, minus the goalie. The fact that Bouillon was on the ice for NINETEEN road goals against is completely unacceptable. That number might be hidden by fancystat websites that don’t see any value in player home/road splits but for those of us who feel more info is always better; Bouillon is a poster child for why splits are important. If anyone should’ve been aware of Bouillon’s road woes, you’d think it’d include the Habs GM and coaching staff who want him to help break in rookie defensemen. A task that turned into a nightmare for Jarred Tinordi in the playoffs. Overall, Bouillon’s 5v5 On-Ice Plus-Minus per 60 Minutes appears solid at +0.33 while being on the ice for 37% of the Habs ES goals for and 35% of their goals against. All of those numbers however were padded from the time Subban spent being stuck as his partner. Whenever they were separated, Subban got better and Bouillon got worse and on the PK, every time they experimented with Bouillon, it ended badly so his usefulness is quickly coming to an end. For someone who should have been a 6/7 depth defenseman this season, Bouillon receiving the 3rd most ES minutes with brutal road numbers was crazy is utterly insane. Next season, Habs fans better hope he's averaging closer to 13 ES minutes a night. After being benched for the playoffs and as a pending UFA, I doubt anyone expected Marc Bergevin to offer Drewiske a 2 year contract. I know I didn’t but let’s recognize the move for what it is; a cheap stop-gap, as is Bouillon, to buy time for one of the kids to force their way onto the roster. Kids that should be developed as much as possible in the AHL, not brought up to learn on the job because they don’t have faith in their farm to get them ready. Drewiske is more effective on the PK than Bouillon, though that bar isn’t set very high. He should also be comfortable with less than 15 ES minutes whenever he does play, which as a fringe, depth defenseman will be about 40-50 games next season. It’ll be interesting to see if the Habs need for a physical, mobile defenseman like Tinordi next season will trump the need for him to get in another 30+ games of AHL seasoning. Physically, he’s ready but he still has more to learn about making defensive decisions. If the goal is for Tinordi to help at even strength and eventually bolster the PK, playing 20+ minutes a night in all situations with the Bulldogs would accelerate his development far more than 12 protected minutes in Montreal. Being paired with Bouillon in the playoffs was nothing short of a disaster so when he’s ready for a bigger role, Tinordi will need a more reliable defense partner who can actually still lead by example. Offensively, Beaulieu is NHL-ready but he’s not physically ready, nor is his defensive game where it needs to be. That will all come with time so unless the Habs need a power play specialist, his development would best be served with another season in Hamilton, or at least most of it. Pateryn’s biggest asset right now is being a right-handed shot. Rewarded with 3 games in Montreal, he likely isn’t in the Habs long term plans, especially if Morgan Ellis rebounds from what was a rough first season as a professional hockey player. While Marc Bergevin could wait until next year to use his 2nd buyout, I highly doubt he will and all signs pointing towards Tomas Kaberle as the likely candidate. Why else would you sit him for the last half of the season with Emelin, Diaz and Weber all hurt? Weber lost his job to Diaz at the start of the season and got hurt just as injuries finally created an opportunity to get back into the lineup. Now that he's a RFA with Drewiske signed for 2 years and a group of kids marinating in Hamilton, Weber's days in Montreal are over.